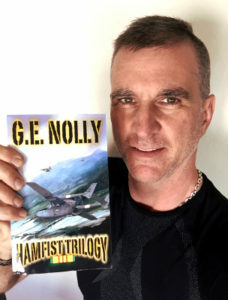 Proud to be George Nolly’s 131st interview on his Ready for Takeoff podcast. 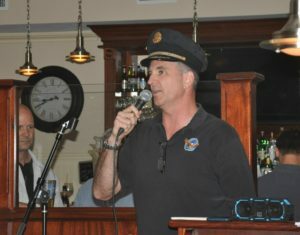 Like me, George is a professional pilot and a published author. I’m currently reading his Hamfist Trilogy, and I’m hooked. My greatest wish is to see the true cause of TWA Flight 800 revealed. I lost my fiancée Susanne Jensen when that Boeing 747 exploded off the south shore of Long Island during the summer of 1996. I was a TWA pilot at the time, and she was a portfolio manager for GE Capital traveling to Paris for business on my airline. The July 17th anniversary of that commercial aviation catastrophe always brings me both sadness and anger, but with you in office this year I also have a bit of hope that you will end the government charade. You will recall that President William Clinton was running for re-election when TWA Flight 800 met its demise. With your strong aversion to ‘fake news,’ please conduct your own Presidential review of what happened during the aftermath and ‘investigation’ of the cause. I believe you are the only person with both the security clearance, and the political will, to reveal what I firmly believe was a deliberate Clinton cover-up. The truth is already 21 years overdue, but revealing it now will demonstrate why our nation is better without another Clinton in the White House. Thank you for your attention in this matter that is of the highest importance to me. Below is a link to the first chapter of my memoir 13,760 Feet—My Personal Hole in the Sky that I hope will help make this issue personal for you as well. 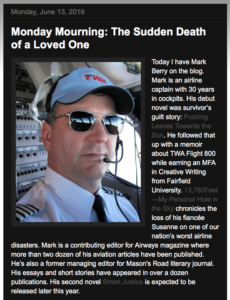 This is the video of my 20th anniversary speech about losing Susanne onboard TWA Flight 800 – the Boeing 747 that exploded offshore Long Island on it’s way from JFK to Paris, France. It’s a remembrance for her, a tribute to the crew, an appeal for the truth, and my experience with survivor’s guilt and grief that pushed me to first write a novel, and then to stop hiding behind fiction and write a memoir. Included in these 55 minutes are Susanne’s last recorded words, snippets of TWA 800’s final communication with Air Traffic Control, and some of my earliest original companion-song lyrics performed by special guest musicians. I prepped for a year for this speech, and completed the Toastmasters C.C. Manual while leading up to this emotional explanation of the deepest part of me. I’m proud to announce that today my writing is featured on The Death Writer blog hosted by Pamela Skjolsvik. 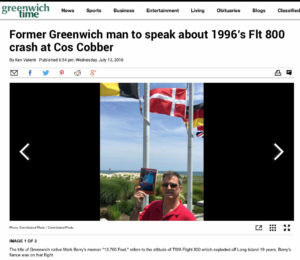 It’s always an honor when another aviation author discovers my memoir and then takes the time to write a rave review. Thanks Emelio Corsetti III for your kind words.